Jane Austen. Fact: born December 16, 1775; died July 18, 1817 at age 41. Fact: never married. Fact: wrote six complete novels, including a few unfinished works, and juvenilia. Fact: lived out her life in a quiet Chawton Cottage with her older, spinster sister Cassandra and aging mother. Also known is that not long before her own death, Cassandra burned much of Jane’s private correspondence and even cut out entire passages of the letters saved, driving many discussions as to why? Many Jane Austen biographies abound and mention her brief flirtation with Tom Lefroy at the age of 19, and even her short-lived engagement to Harris Bigg-Wither, heir of Manydown Park, where over night she retracted her acceptance of his hand. But nothing from the author herself. Nothing as rich as a personal journal. What a literary triumph that would be to discover such a one! Surely, a writer with transparent understanding of romance, great love and human nature would have had her own back story to mine such rich characters, conversations and scenarios as found in Pride & Prejudice, Persuasion, et al. Surely, such a mind would have experienced first-hand what it is to be in-love! 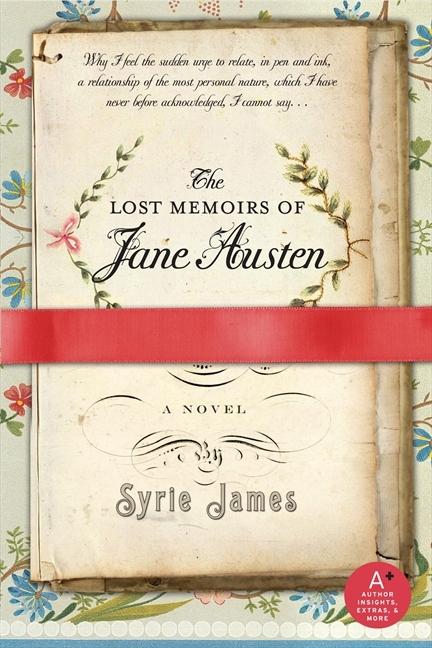 Author Syrie James undertakes this venture of speculation in her novel, The Lost Memoirs of Jane Austen. ‘If first impressions are to be believed, Miss Austen’ he began. Although knowing from the beginning that this was entirely a tale of fancy, and knowing in my head that Jane never married, the story filled my heart with an impossible hope. Moreover, I was surprised when I found myself weeping when the happy event never came to be. Syrie James has extensively researched Austen’s life and Regency times blending what we know as fact with the mysterious lore created by the gaps unknown to her public, creating a beautiful, fictional what if. The footnotes, maps and Austen family tree as well as the chronology of her life were delightful reference bonuses. Also included is a Q & A with the author, Quotations from Austen’s works and letters, and even Book Club/Reading Group Study Guide discussion points. Although this novel is a work of fiction, I read it through wishing all along that it were not. Like many, I would like to imagine this brilliant, opinionated, witty woman had met the great love of her life and that she did in fact experience some of the magic she so keenly wrote of. Syrie James successfully creates a world of Jane Austen we can only wonder. “…but for my part, if a book is well written, I always find it too short.” (The Juvenilia of Jane Austen) With such sage words I can only echo that The Lost Memoirs of Jane Austen is indeed entirely too short! Great review, esp the book snippet, my fave. I loved the “lost memoirs” book, just like LA, a part of me was wishing this was truly Jane’s unknown story. Loved Mr. Ashford’s character – gentle and yet interesting, esp with his engaging conversations with Jane, it was easy to imagine them as real! I loved the way how Ashford’s character was worked into Jane’s real life events, making the love story all to believable. I read this book and also enjoyed it very much. I, too, felt that hope while reading. A very good read. I loved reading this biofic. It was great. Just the Jane I have always had in my mind. Brilliant review. I loved this book too. Thanks for the wonderful review! This sounds delish — it’s a bit like reading Melanie Benjamin’s Alice I Have Been — I know she doesn’t marry her first love but when that scene rolled around, I was willing and praying for things to be different. I bet I’ll feel the same way about this! I need to start reading Ms James stat! I really enjoyed this book, too. This sounds very interesting! However, I don’t know that I would want to read this book for the same reason as your last few sentences state of regret that a marriage for Jane could never happen! I think you should give it a try. It is satisfying what if despite what we know is truth. If you should give it a whirl, I would love to hear your thoughts on how much you did in fact like it! :)!! Hmmm…everyone seems to think it’s worth it…so, I’ll keep an eye out for the book. I don ‘t believe I have ever seen any Austen takes by other authors in our book stores! Great review Christina. I read this when it was first released in 2007, and it remains one of my favs. I really enjoyed Syrie James’ writing too. I’m glad you cried too! Now I do not feel like a hopelessly romantic Austen geek!!! I read this book quite some time ago, but now I feel inspired to pull it off the shelf and give it another read. I really did enjoy this book and glad you all liked the review– thanks for your kind comments. However, I am kicking myself for not having read it sooner. And to Laurel Ann, there is nothing wrong with being a hopelessly romantic Austen geek. Its a good thing! Merry- merry to one and all. I’ve eyed this with a great deal of trepidation, partly because I know the true end of the story, as you said, and partly because I was honestly afraid of the concept. It isn’t easy to write fiction that reads like it *could* have happened, when everyone knows it didn’t. After reading this review, I need to add this book to my (ever-growing) TBR pile.